Dol, Ro, Tima, and Lucas are the four Icon Children, the only humans immune to the Icon’s power to stop a human heart. Now that Los Angeles has been saved, things are more complicated – and not just because Dol has to choose between Lucas and Ro, the two great loves of her life. As she flees to a resistance outpost hidden beneath a mountain, Dol makes contact with a fifth Icon Child, if only through her visions. When Dol and the others escape to Southeast Asia in search of this missing child, Dol’s dreams, feelings and fears collide in an epic showdown that will change more than just four lives — and stop one heart forever. In this riveting sequel to Icons, filled with nonstop action and compelling romance, bestselling author Margaret Stohl explores what it means to be human and how our greatest weakness can be humanity’s strongest chance at survival. When I read Icons by author Margaret Stohl I had mixed feelings on the novel. The sci-fi portion of it was pretty badass and the idea of the Icon Children was pretty unique. The way that the novel ended definitely left room for a potentially awesome sequel. Don’t get me wrong, I’ve been a huge fan of Margaret Stohl’s ever since I read her co-written novel Beautiful Creatures, but Idols was missing the same punch that Beautiful Creatures packed. Still I was interested in getting to find out where Dol and the Icon Children’s story would go. In Idols, Dol and the four other Icon Children have just saved Los Angeles but this has only made things more difficult than they could ever imagine. For Dol this is because she must choose between the two loves of her life: Lucas and Ro. One of which she has known practically forever and the other who she has been attracted to since they met. Now on the road again to an outpost that is supposedly sanctuary, familiar faces reappear and something new surfaces. A young girl appears before Dol calling them both sisters and forcing Dol to find a possible fifth Icon Child. As their search leads to Southeast Asia the Icon Children discover secrets about the reasons behind their existence and face a new unexpected threat from the Icons. What I noticed first off was that Idols has way more action than the novel before it did. There are more explosions (literally a lot of explosions) and more threats against the lives of the characters. I love action. Seriously fight scenes are the best thing ever since sliced bread. However in moderation (just like bread) actions scenes are kickass. While I felt that Idols had a little bit too much where there could have been better room for character growth/plot development—we still got those explosions and their aftermath. Compared to Icons, Idols was a bit lacking. There were a lot of things that happened too quickly or too slowly and there wasn’t a set-pace. There would be moments that were high and moments that were low but there wasn’t a definitive pacing. Some moments I would be bored and the others I would be on the edge of my seat. That mixture can be good sometimes and work for some people but if you’re anything like me you want consistency. The love triangle that is used in Idols didn’t really have me cheering on either guy. I’ve felt distant from Lucas and Ro since Icons and this novel didn’t help me clear it up any more. We know that inevitably Dol must choose one of them as is a must with love-triangles. She does choose in this novel and it isn’t a very surprising choice. In terms of this love triangle I found it wasn’t executed as well as it could have been but still added some drama to the plot. What I loved most about this novel was what happened between the chapters. There are conversations between a scientist and a space entity called NULL which act as a bit of a pre-story to the current plot. I loved it. I loved the way it was written and how much was described and said with only transcripts of a conversation. That is the kind of writing I wished I could have seen throughout the novel because it was phenomenal. Idols ends in a way that sets it up for another book and I am pumped for it because it seems like Dol’s character is going to do some pretty crazy stuff. The kind of crazy that I am a big fan of. I can’t wait to see what she’ll do and if it’ll all be worth waiting for on my part. I would recommend this series to fans of sci-fi, readers who love love-triangles and to any readers who are fans of Beautiful Creatures and want to read more from one of the authors. 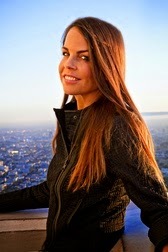 Margaret Stohl is a lifelong science fiction fan, former video game designer, coauthor of the New York Times bestselling Beautiful Creatures series, and author of Icons. She lives in Los Angeles, California, with her family.